Destin, Florida has plenty to do during all four seasons! from harbor hotels, to family-friendly dolphin cruises, check out some of the top Destin Fall 2016 travel deals! 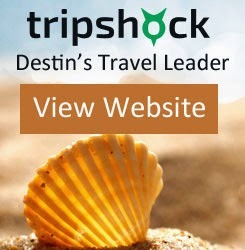 Check out all our current deals online at TripShock Gulf Coast Vacation Deals & Discounts. Book a Stand Up Paddleboard in the Destin Harbor and receive a 15% discount! Short instruction available upon arrival, great activity for the whole family! ONLINE SPECIAL: Adult $17 (Reg. $27) September - October 1:30pm Cruises ONLY! Limited time offer on all other cruises - Adults $22 & children $13!! 7th Night FREE all year 2016 (not valid holidays). Includes 2 Dolphin Cruise Tickets, Wi-Fi, Free Parking and 10% off at the on-site Spa. Spring and Summer Savings at The Palms of Destin: Beautiful Beach Resort starting at $152 for a 2 bedroom condo. Voted best pools in Destin! On-Site Spa, park, and Restaurant! Great for families.